What I like most about being a SAHM is that I get to have extra time to create and re-create. What do I mean by that? Uhm, to make butingting. My mom used to scold me when I was in grade school 'cause I have soooo many kalat on the bed. Yup, I sleep with my "crafts" --- dissected floppy discs turned into greeting cards, origami stars in a mayonnaise jar, photo collage as a bookmark, etc. I'm not a Martha Stewart or something like those listed in Apartment Therapy's 10 Crafty Blogs in 2010, but I have a crafty side. I actually have Channeling Martha as one of my Royal Features. 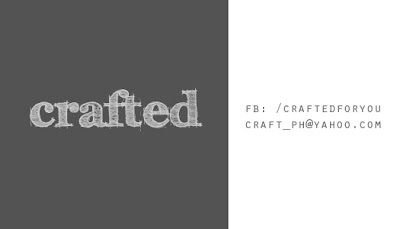 It is basically composed of my DIYs; just simple and little things that I could do with my not-so-skilled and artistic hands. Something that would not require my fine motor skills to be exercised too much. Hehe. Unlike this goddess of a crafter that I have for Nanaygosyante for August. Woot! 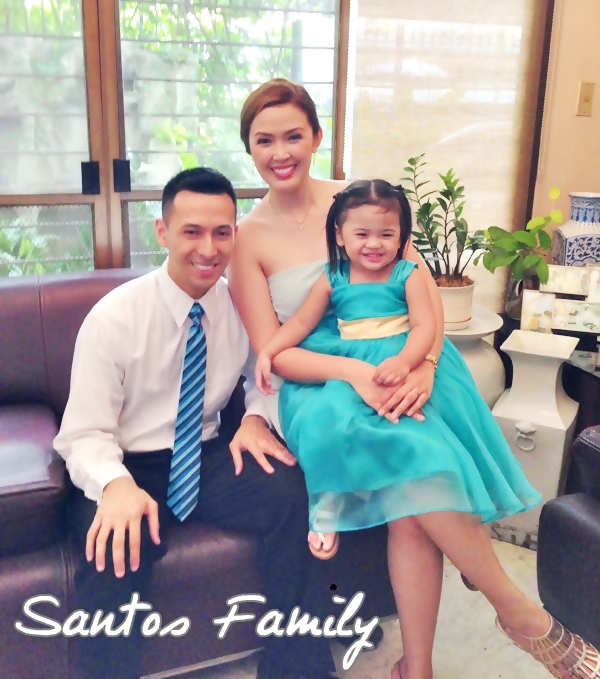 Muthers, meet Ging Santos, the beautiful blogger behind Forty Weeks and Then Some. Like Louise, I met her at the Halo SleepSack Philippines' sparty, too. She was even my spa seatmate! She looked so fresh and mabango; I felt bad for not fixing my hair. Haha! She's one of my girl-crushes, by the way. Why? Because this sweet lady could paint, sketch and just be the artist I dreamt myself to be. 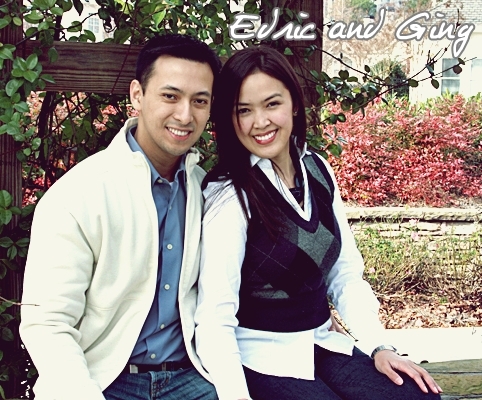 Being related to him, her and him, it makes me feel like I want to be an artist like them, too. Perhaps, I was sleeping and Ging was wide awake with a bucket at both hands when God decided to shower artist dusts. Hehe. Anyway, it's great that she puts that God-given talent to good use; and to making money, too! 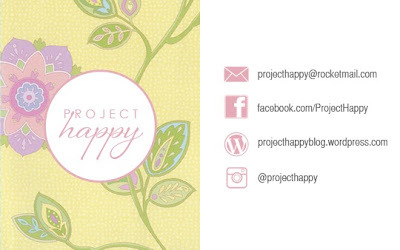 She co-owns Project Happy with her sister and recently opened Crafted. It currently offers cute personalized rubber stamps but would eventually have other crafts, as well. I am actually excited to get some for LB's teachers for Christmas. Aside from managing these two art-influenced businesses, Ging is also an architect. In fact, she recently discussed watercolor to a class of architecture students in UP Diliman. 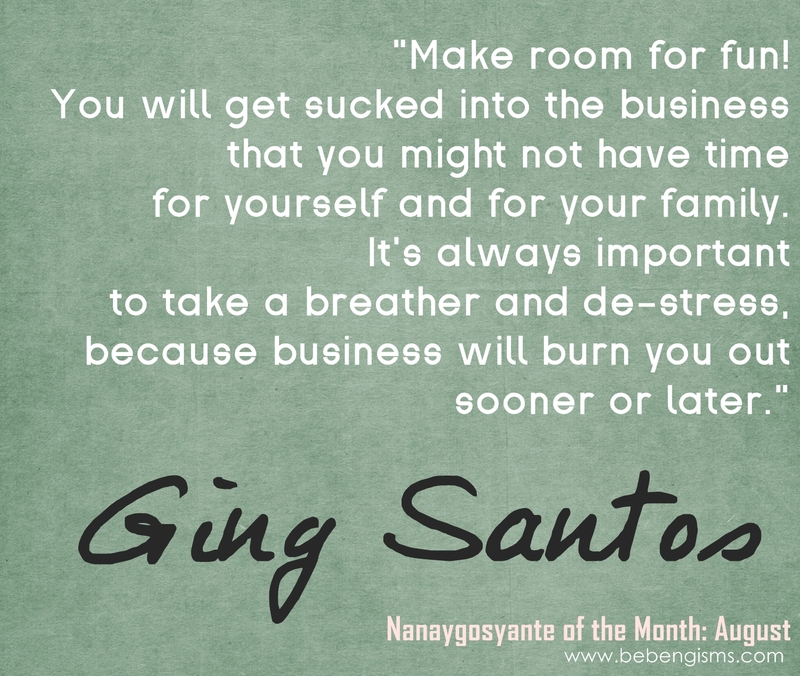 As a mompreneur, Ging makes sure that she spends as much time as possible with her toddler Allie. She sometimes tags her tot with her to the office or leave her to someone she can trust whenever they're doing a pop-up shop for Project Happy. She admitted that it's not easy to be a mommy with no nanny, but it's possible with the help of the husband and some relatives, too. 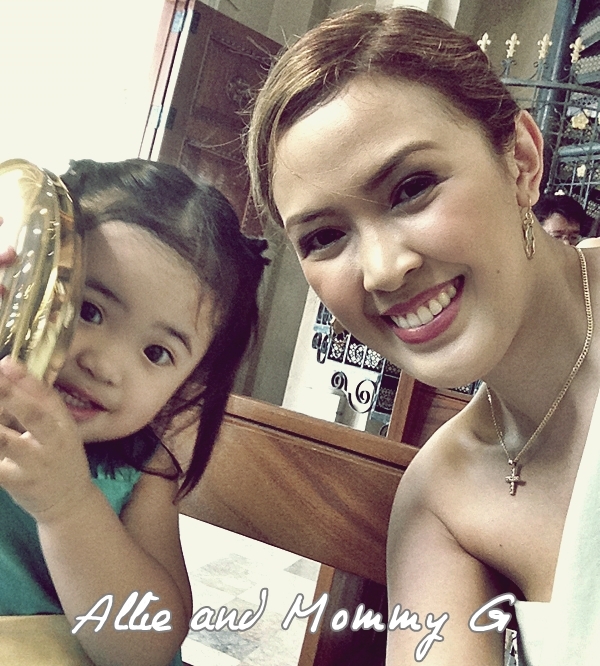 Mommy G loves doing crafts with Allie. Says, Ging: "there was this one afternoon when we made a greeting card for my mom. I tore off pieces of colored paper, and Allie had to glue them on paper. She had so much fun, and I enjoyed watching her. She continues to amaze me, even if just watching her kiddie shows or playing with her letter puzzle." Sometimes, when motherhood and biz get the best of a woman, one would automatically think that the husband will be taken for granted; not for the Santos couple. Since both of them are homebodies, staying at home to relax is their thing. However, they still go out on movie or dinner dates occasionally. 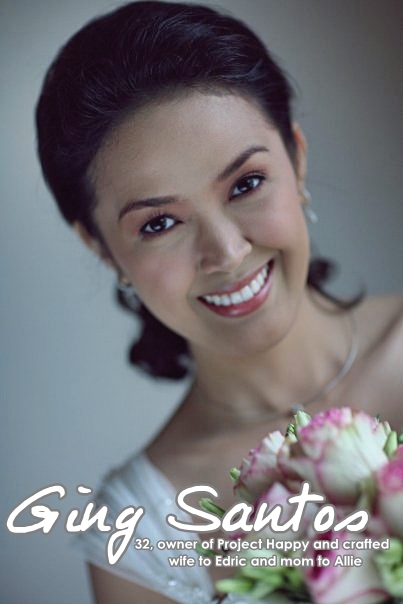 Ging is a no-fuss, more fun kind of gal that her me-time means books and bed, pedicure, salons and shopping. I super love Ging's dainty crafts! Sali ka Denise ha pag nag workshop kami. Lol #ShamelessPlug!